We entered Grosvenor Park at the north east corner, off Dee Lane, and spent a happy hour in the chilly sunshine wandering about looking at the trees. 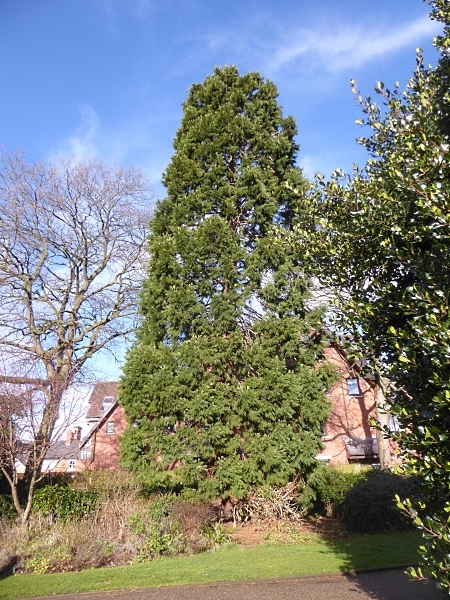 There is a tall Giant Sequoia Sequoiadendron giganteum (which may only be quite young) at the northern edge, which had dropped some very large cones. We admired the rich mahogany bark of a Tibetan Cherry, some young Turkey Oaks with retained leaves and whiskery buds, and this lovely cone of the Tulip Tree, about 4 inches long. We lunched in the rose garden. Some scattered grain attracted sixteen Wood Pigeons but the Blackbird that had been hopping about in the shrubbery didn’t come out to compete for it. Half a dozen Jackdaws flew over. 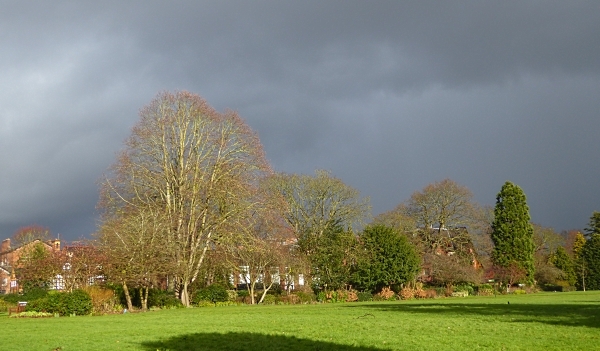 Then the sky went very dark and we had a brief rain and hail shower, which sent us scrambling for shelter under the Yews. Along the lower path with the ruins of the old church we spotted a Contorted Hazel and an Indian Bean tree with huge numbers of hanging bean pods. 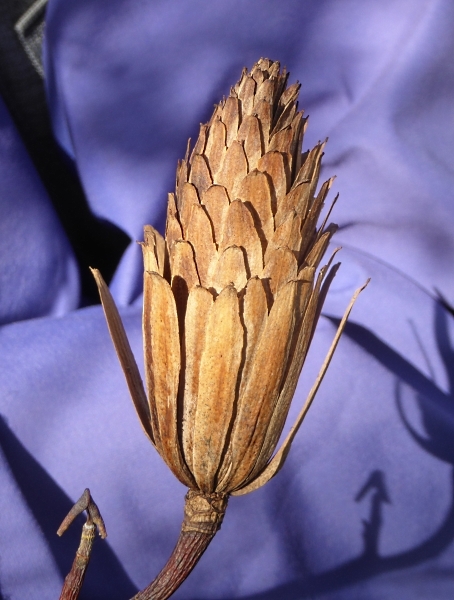 It must have been a lovely sight when it was in flower. 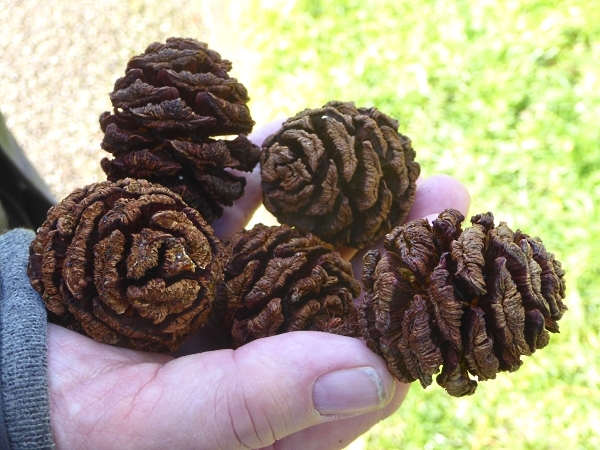 There was another redwood-type tree there, with red shaggy bark and tiny cones at the tips of the cypress-like branchlets. 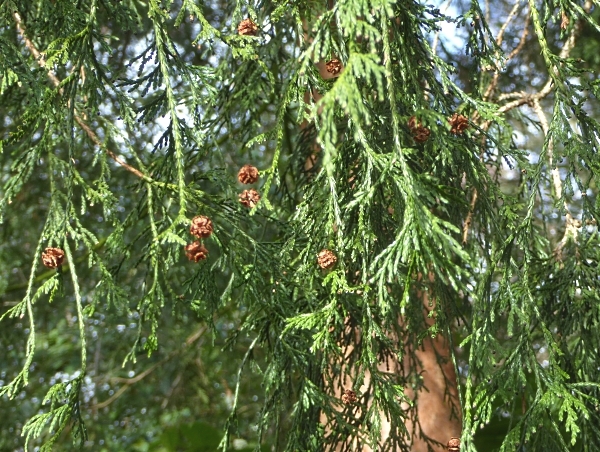 I didn’t have my tree book with me and was puzzled by it, but now I see it was probably a new one on me, a Summit Cedar Athrotaxis laxifolia. 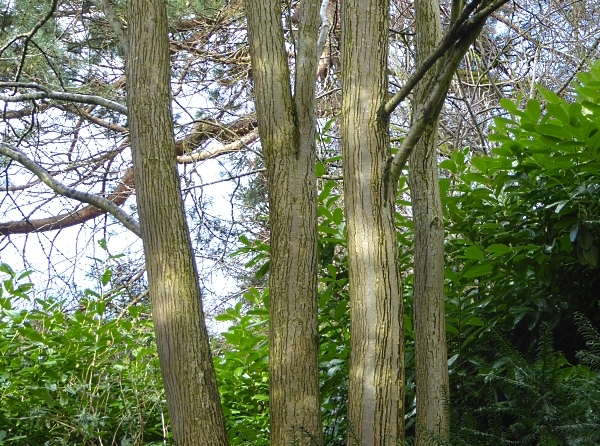 A tree with four trunks caught our attention. What is that light grey bark with long dark fissures? Happily, there was another nearby with a tree label. It’s a Katsura, which will have heart-shaped leaves like a Judas Tree in the spring. Its leaves turn yellow in the autumn and smell like candy floss. Then we headed down to the Groves, looking at the Black-headed Gulls (BHGs) along the riverside, hoping to find our interesting Norwegian commuter. There were a lot of them there of course, but none with leg rings at first. There were plenty of Mallards, two Mute Swans, a single Cormorant diving and fishing, and a few Moorhens. 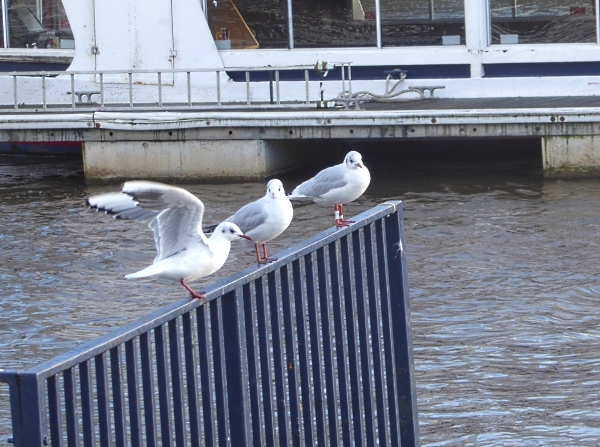 Then we spotted a BHG with a ring perched on a railing. It flew off and we followed it. We tracked it down to the jetty under the City Walls and found that it wasn’t our Norwegian friend J4U8, but a different one, number T4R0. I have since looked it up and it appears to have been ringed in Poland. What a cosmopolitan lot the BHGs are in Chester! Added Tuesday 12th Feb. Yes, this bird IS from Poland – I heard from the Gdansk museum today. 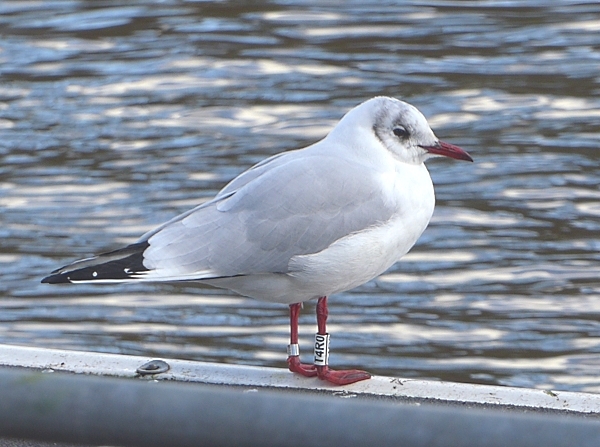 Ringed as a nestling in 2010 at a lake called Zbiornik Przykona between Poznan and Lodz. It’s been commuting between its home lake and Chester ever since. BHGs are amazing little birds! Public transport details: Train to Chester from Lime Street low level at 10.17, arriving Chester 11.01. Returned on the train from Chester at 2.30, arriving Liverpool 3.15.